Bedford Point's spoof of Times Square at night in GTA III. Bedford Point is a financial district in southwestern Staunton Island, Liberty City in Grand Theft Auto III, Grand Theft Auto Advance and Grand Theft Auto: Liberty City Stories. It borders Torrington to the east, Belleville Park to the north and an specified body of water to the south and west. Bedford Point is a commercial core in Staunton, housing much of the city's massive skyscrapers, museums and galleries, which are primarily concentrated towards the north, east and south. In comparison to depictions of neighboring Torrington as a place of "big business" and formality, Bedford Point's occupants are seemingly more culturally-inclined and less formal in appearance. The district has no gang activity, although some businesses pay protection to the Yakuza as noted in "Shima" in GTA III. General appearance of the Bedford Point district, as viewed to the east from Francis International Airport. View of the west Bedford Point. The center of the district is the city's equivalent of New York City's Times Square. Here, the player can see many signs that advertise businesses and other stuff like Punk Noodles, 69th Street, Funcola, Top Down City, Flashback FM, Doghouse, Gasoline, Half-Cocked, and Liberty Soul FM. 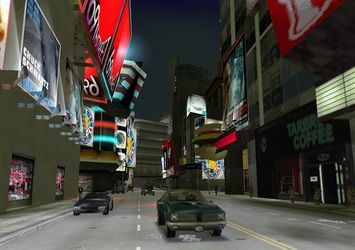 A functional digital clock and temperature gauge, as well as another analogue clock, are also featured in the GTA III rendition of the area. Bedford Point contains a church on the west side with two cone shaped towers; this is most likely home to a Liberty City convent. In 1998, during GTA Liberty City Stories' timeline, there was a graveyard near the church, complete with the people who died, notably the storyline characters. By GTA III's timeline in 2001, it is replaced by an opera house leaving the church little more than a narrow strip of land for use as a cemetery. The district also houses the second tallest skyscraper (after another in Torrington) in the city, which happens to be the tallest in GTA Liberty City Stories as the aforementioned Torrington skyscraper is only half its height. In addition, Bedford Point contains an underground subway station for the Liberty City mass transit system at the southeastern corner of the district. The subway will take players to Chinatown, Francis International Airport and Liberty Campus' upper subway station. The Bedford Point clock and thermometer, GTA III. The Liberty City Cathedral, GTA III. The Liberty City Cemetery, GTA Liberty City Stories. Bedford Point station, GTA III. Love Media building, including Donald Love's residence in GTA III. TW@ internet cafe (at the border with Belleville Park). Unnamed Bedford Point art gallery (internally named "artglry_stn"), GTA III. The building houses Liberty City Free Radio in GTA Liberty City Stories, circa 1998. Unnamed Bedford Point courthouse (internally named "courthse_night", GTA III. Unnamed Bedford Point opera house (internally named "opera_house"), GTA III. The building occupies the site of the Liberty City Cemetery featured in GTA Liberty City Stories, circa 1998. The Love Media building, GTA III. Star Junction, a similarly designed district in the succeeding rendition of Liberty City. This page was last modified on 19 July 2012, at 23:07.